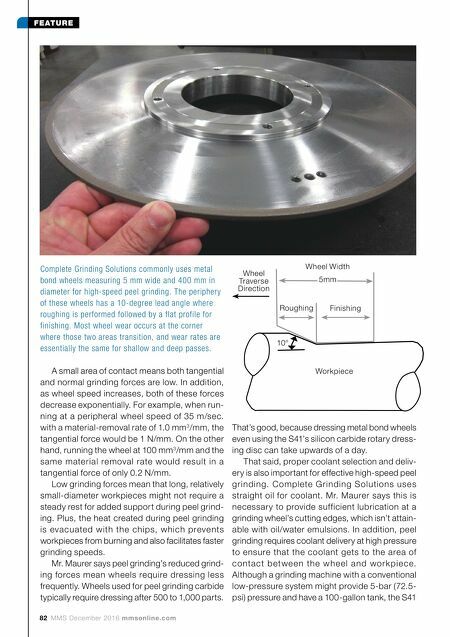 mmsonline.com December 2016 MMS 83 FEATURE for high-speed peel grinding offers 50-bar (725-psi) pressure and has a 500-gallon tank. Because straight oil is used as the coolant, the S41 has an integral f i r e d e te c t i o n a n d s u p p r e s s i o n system. Were a fire to start, rubber tubing routed inside the machine would rupture, triggering a valve to de live r a high volume of c ar bon dioxide through multiple dif fuser n oz z l e s i n s i d e th e wo r k zo n e to extinguish it. 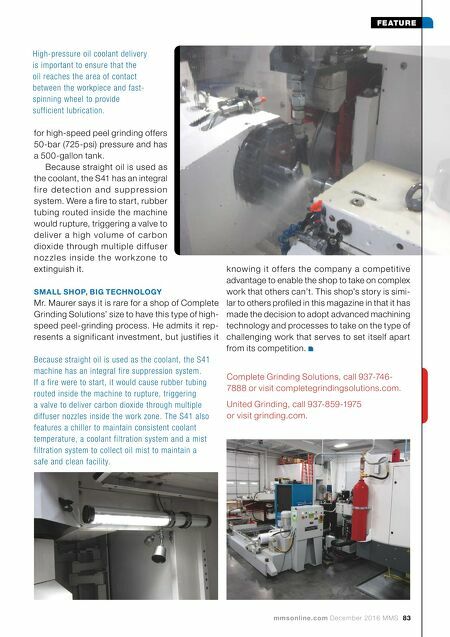 SMALL SHOP, BIG TECHNOLOGY Mr. Maurer says it is rare for a shop of Complete Grinding Solutions' size to have this type of high- speed peel-grinding process. He admits it rep- resents a significant investment, but justifies it knowing it of fers the company a competitive advantage to enable the shop to take on complex work that others can't. This shop's story is simi- lar to others profiled in this magazine in that it has made the decision to adopt advanced machining technology and processes to take on the type of challenging work that serves to set itself apart from its competition. High-pressure oil coolant delivery is important to ensure that the oil reaches the area of contact between the workpiece and fast- spinning wheel to provide sufficient lubrication. Because straight oil is used as the coolant, the S41 machine has an integral fire suppression system. If a fire were to start, it would cause rubber tubing routed inside the machine to rupture, triggering a valve to deliver carbon dioxide through multiple diffuser nozzles inside the work zone. The S41 also features a chiller to maintain consistent coolant temperature, a coolant filtration system and a mist filtration system to collect oil mist to maintain a safe and clean facility. Complete Grinding Solutions, call 937-746- 7888 or visit completegrindingsolutions.com. United Grinding, call 937-859-1975 or visit grinding.com.